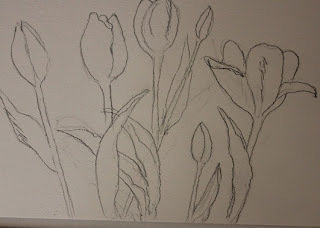 I know it's spring and I am excited about it, truly, you've seen my sketches and my tulips, but this idea has been n my head since last fall. It is finally finding it's way out. Using the pinking rotary cuter, I had time before leaving for my errands this morning to get some 'leaves' cut, and I laid them out on the birch trees. already they are coming alive! 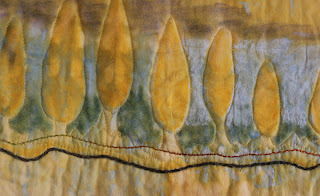 I will free motion stitch them all together using a water soluble stabilizer and then I can apply them. I envision some small shrubbery like red alders or dogwoods in the foreground. Isn't it funny how the color changes depending on the time of day? This second one I just took mid afternoon. I'd like to confess that I sometimes, OK, at least once a week, meet friends at Tim's, a local coffee shop. It does feel somehow naughty, like I should be doing something productive instead, but on days when I feel down and not likely to be very creative anyway, the girl chat gives me a boost. Thanks Donna and Anne! I came home made lunch for Gord, went for a nice walk, and then got creative. I've had a picture in my mind of a stand of new growth birch trees which I wanted to try to produce again using the shibori wrapped fabric on the tin can method. Oops, sorry I forgot to take a picture while it was on the can, I got excited! Basically, you wrap a piece of fabric the circumference of the can with string, continuing to the top; scrunch it down the can, wrap some more and so on until all the fabric is all on the tin can. 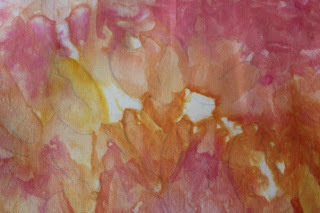 Then I paint the folds that are created with 2 parts discharge paste, 1 part paint. I take them off right away, cover my iron pad with protective cloths both under and over and iron with steam. It's important to be well ventilated. I love the first piece. It may not show perfectly in the picture, but the greys are beautiful and there is yellow in the background fabric which really looks like rays of sunlight. I have plans for this piece. 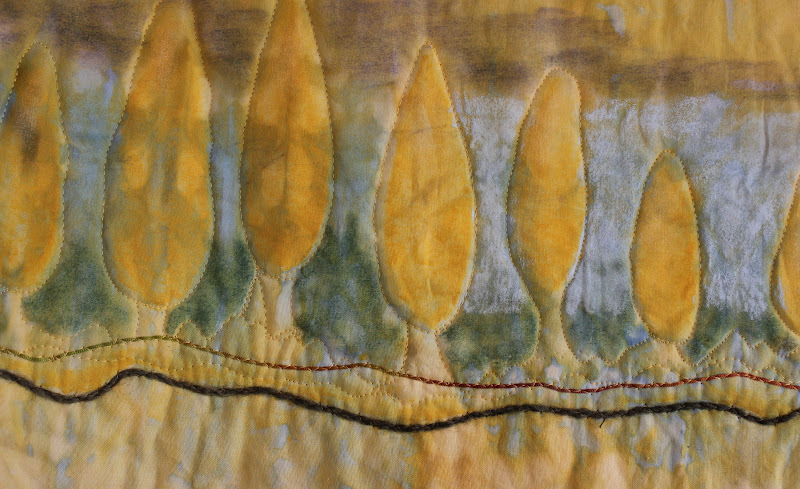 I see it with gold leaves and lots of foreground shrubbery, both machine and hand stitched. 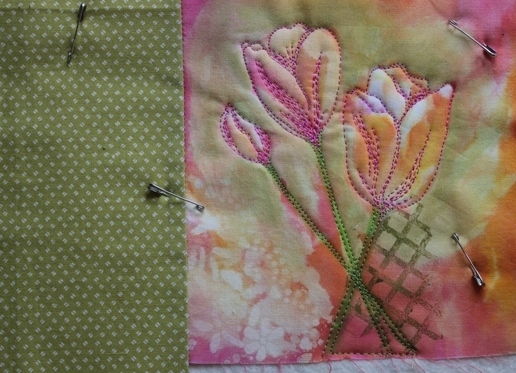 The second piece is on a lighter fabric. I tried it once with the birch trees and it didn't really work, so I thought darker ones would. It turned out pretty well too. This is what my table looked like this morning. 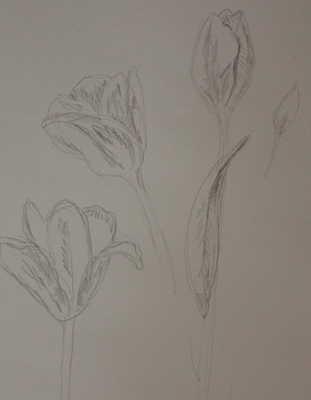 I was playing with tulip sketching again last night. Also, I've picked out fabrics for a more girly improv quilt like the last one. 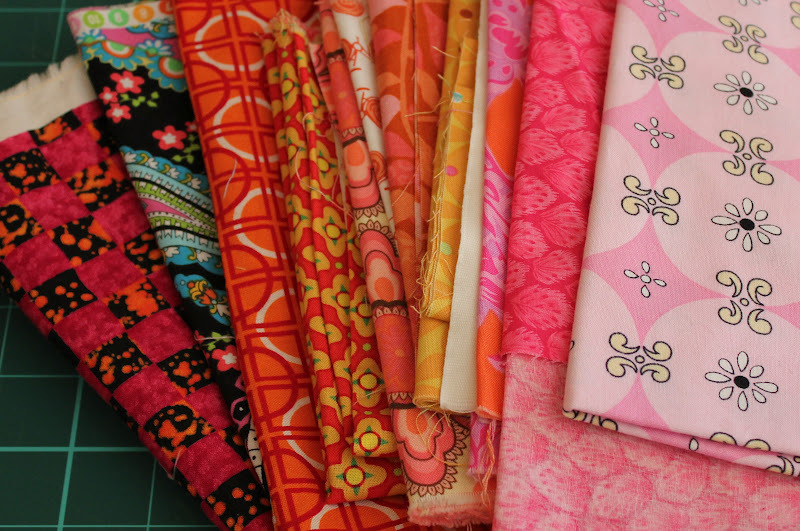 I may add some greens into it but here's my array of pink and orange. And finally, here's a failure. I thought I might like to add some green using the discharge paste on the tulip piece I've already started stitching, so I thought it best to try it on a another sample. That was a good thing. A smaller sample would have been even better! I got mixed up which green I had used before. This was obviously the wrong one. Someday, I may find a way to use it. I like the green it just doesn't work where it is. 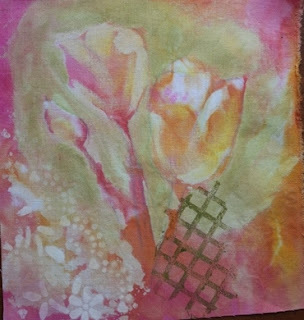 I can always paint or use pastels over the it. It will be a challenge to see if it can be fixed. So far my weird headaches seem to have been a a 24 hour thing. The sun is shining, I had my Wednesday swim and after lunch I finished putting the pieces of my baby quilt together. Aah, satisfaction! The top is done, I think, and I will put it away for now. 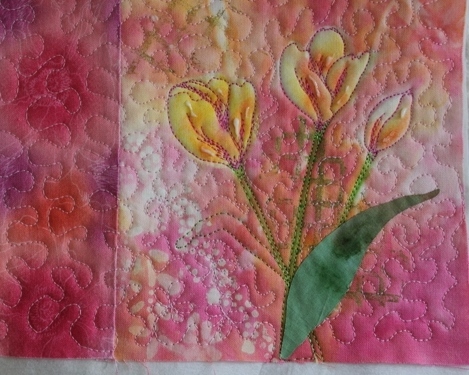 Perhaps I'll save the quilting for a retreat that I've got coming up in May. Thanks, Elle for pointing out the obvious line of dots (they actually are bicycles). I fixed it. Now, I'm quite excited because I'm heading out to pick up a package I've been waiting for anxiously. I've been saving my cash, even toonies and loonies and I ordered myself the I Pad 2. since the new one is out Apple was offering them at a very good price. This is not a light purchase for me, so I can't wait to try it.. 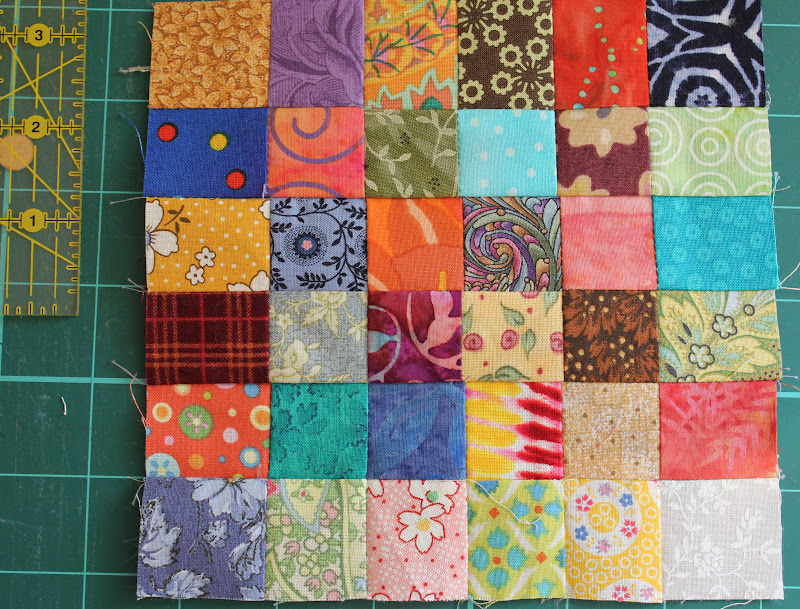 I've been working on the improv baby quilt for the last few days. 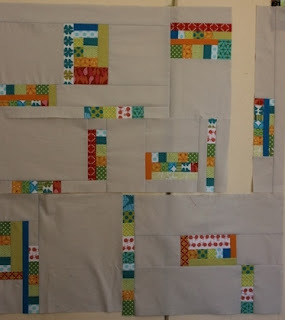 It really is like putting a puzzle together once all the bits have been made and randomly thrown on the design wall. It is almost finished but there are still a couple of bits bothering me so I'm stopping here for today. The second picture is the same except I've cropped out the blue strip on the left. I believe I'll take it off. There will also be some grey added to the bottom so it will be a little more rectangular. I'm dragging a little today and didn't work as long as I'd hoped yesterday. I had a weird stabbing headache that got worse as the day wore on. My husband wanted me to go to emergency, but I managed to see a doctor this morning. She said I probably should have although it has stopped today. It may have been a type of nerve pain. If it happens again, I'll have to get more tests. I'm almost embarrassed to go there as I go so often. Anyway I'm better but tired today. 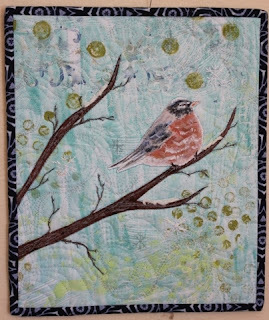 I'm linking to The Needle and Thread Network for WIP Wednesday. 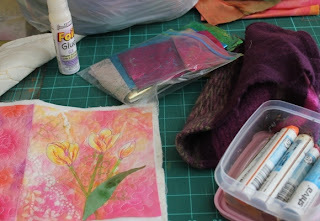 I'm posting this photo today to join in on the messy work table collaboration over at Fibra Artysta. While I've been giving myself permission to be a little more messy of late than I normally would, I see that it's nothing compared to the host blogs table! 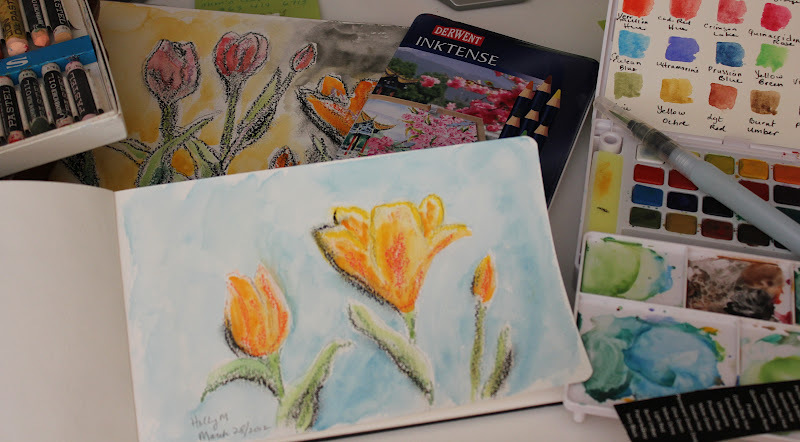 I have a couple of projects going on at once and yesterday I decided to sketch and paint. It was pretty bad last week when I was cutting strips for my improv pieces but then on Friday I cleaned it up. Little baskets are really helpful. Every so often Gord and I like to go for Sunday breakfast which we did this morning. Before leaving we had our fruit with yogurt, so we could walk the bridges downtown before going to the Nectar restaurant for our favorite Mediterranean omelet. Since we took supper to the in laws yesterday, I had the afternoon today to play in my studio. 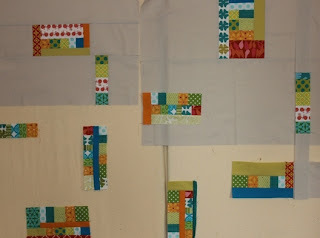 First, I spent a couple of hours playing with the improv pieces I made last week, arranging them somewhat how I might like the finished quilt, Then started to cut the gray and piece it to the individual blocks. While the free piecing method is really fun and addictive (I highly recommend it!) because one can simply 'slash and sew', the hard part comes when it has to be all fitted together. I suppose one could get really organized and sketch it all out with the dimensions. That's just not my way of working. I need to lay it out and measure and cut as I go. I can see how it might take me a few days to get it put together! 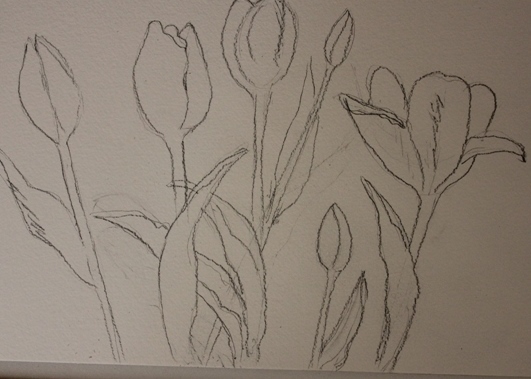 Since my back was getting tired, I decided to switch gears and do a sketch of the tulips from a photo of last years garden. 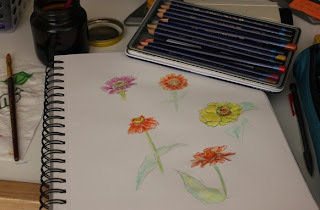 The theme this month at The Sketchbook Challenge is flowers, my favorite thing to draw so I thought I'd get some drawing practice. Jane Davies video was my inspiration. she says she's uncomfortable drawing flowers. I think she's pretty darn good! I began with a quick outline sketch using a charcoal pencil. 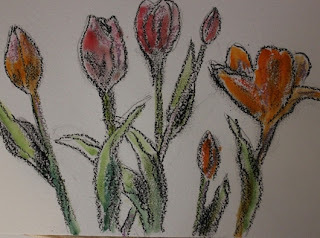 Then I outlined again with a black oil pastel and rubbed it in some areas. And finally some background watercolor. Every Friday I mention my lunch with my 'Friday friends' at the Cafe Gourmet here in Bathurst. I thought I'd show you the scene. It has lovely arty ambiance. The meals are all home made and healthy, no fried food here! Even the sweets are made from scratch. In the afternoon, I was quite anxious to get back to my improv baby quilt. It is a fun and addictive process. There is no measuring or planning to start. I call it slash and stitch. The planning and the math comes next as I try to arrange the pieces and fit it together. I actually did a few more pieces after this. I've decided not to include the one with the diagonal piece. 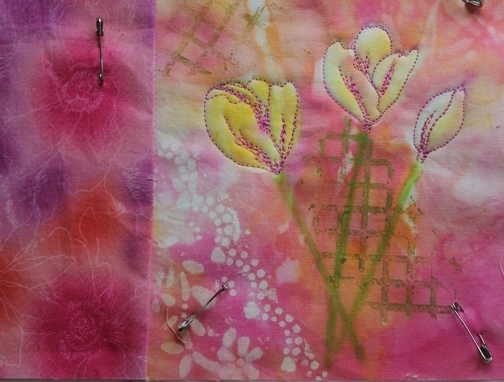 I'm planning to do a little shopping this morning and sew later this afternoon. 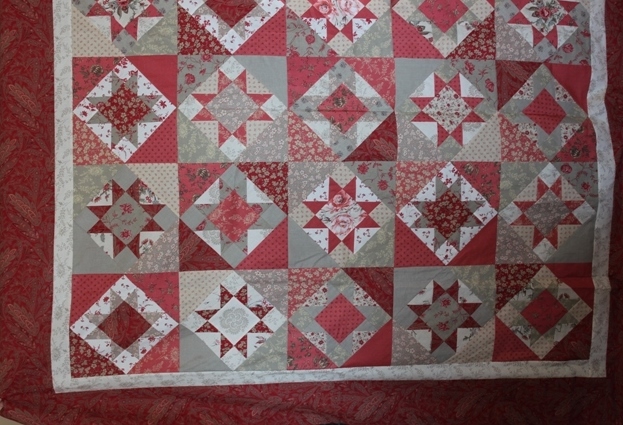 For a while now I have been attracted to the improvisational piecing work that is out there and yesterday I decided to give it a go. 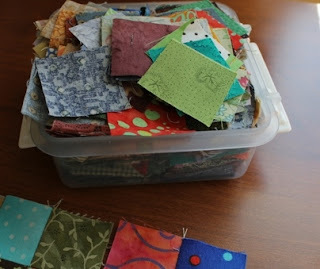 Some quilters will undoubtedly find it a little too much, while others who love the process will find it bland. 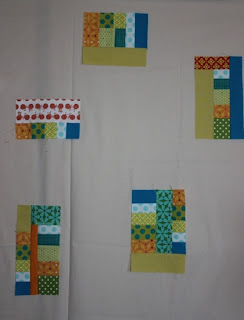 I made a conscious decision to stick with straight lines and use the rotary cutter for my first attempt. 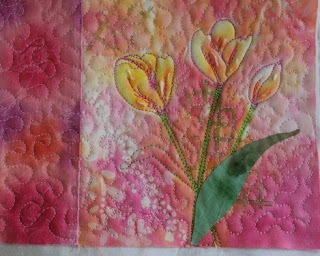 It's funny how I can be so free with paint and mixed media but I find it hard to escape the boundaries of 'proper quilting' rules. I have used a color scheme of turquoise, mossy green and orange. I really like the work being done using solid colors, but since I had these fabrics on hand, I wanted to use them. Also, the background will be the soft grey because that was in my stash. I'm already planning another one using pink and orange, my current favorite color scheme, and I'd like to try cutting things a little wonkier. Baby steps. The next step will be to make a few more pieces and sew them into the grey. This part will involve some math to fit it all together, but shouldn't be too difficult. It can be a messy process. 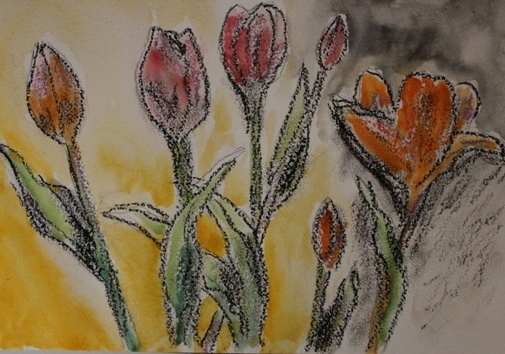 I will get back to my tulips; I just needed to get this out of my system. Sometimes one needs to switch gears a little to return refreshed to a project. I'm off now to do a little yoga and then go out for my errands and Friday lunch. 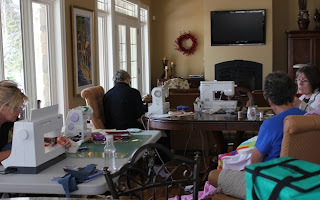 We had a wonderful sewing day at my friend Paula's yesterday! 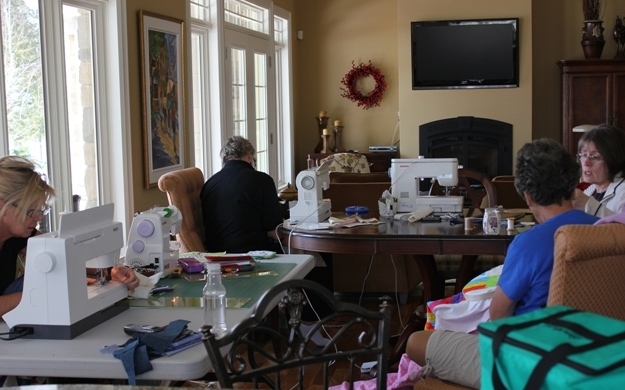 She gracefully offers up her spacious wonderful sunlit home every once in a while to our little group of quilters. There are about twelve us but often several are unavailable. I believe we saw 8 people at different times yesterday. Some of us stayed for lunch and supper. 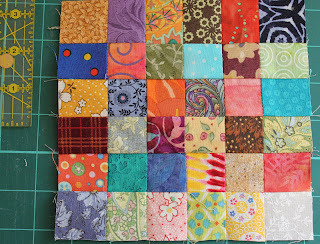 I was very happy to have finished all the blocks for the quilt I'm working on which I cannot show. Wendy showed her Scnibbles quilt that she just finished up. She and Sue are both doing them, but I missed getting a picture of Sue's. 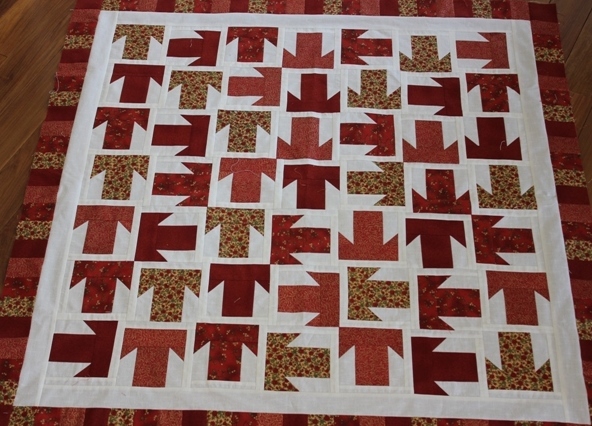 I showed this quilt once before in its process. 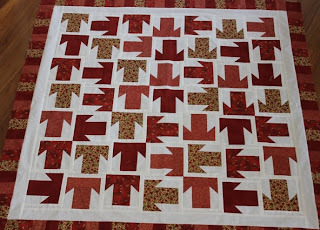 Paula finished putting the borders on it yesterday. 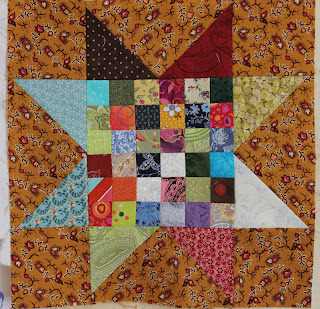 It is a block of the month quilt from Moose on the Front Porch. I also showed this one a couple of weeks ago that Glenda is finishing. It is really something to see. Each person in our group has made a small piece of it. she took those pieces and added many more details.She spent yesterday adding a turtle, toads, lily pads and bulrushes to the bottom part. Sue who is one of the working girls dropped in after work for dinner and some hand work. 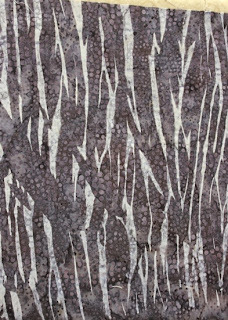 This is one of her recent quilt top finishes. It is always so wonderful to spend time doing what you love with friends. There were moments of animated chatter interspersed with moments of concentrated quiet. The weather outside was sunny and warm, so we were able to take a stretch on the patio. I came home around 8 pm feeling so relaxed and happy! Today, I'm being lazy. I will get to some sewing on my tulips perhaps this afternoon. The weather here is something else! We are having record breaking days this week. It seems so out of place with all our snow but boy is it melting. Today, I went for my swim which I usually do on Wednesdays. 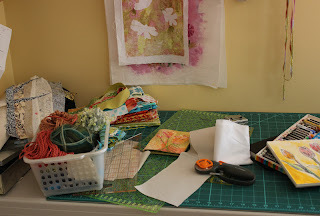 One of my little quilting group members is having a sewing day, and I want to get in as much as possible. We are brown bagging it for lunch and ordering in supper. 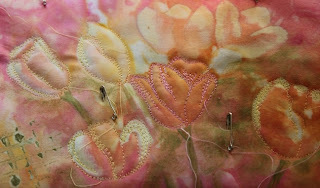 I had time this afternoon to sandwich the larger of the tulip pieces after doing a little discharging on it yesterday. It seems right that I'm starting it on the first day of such a spring. I've only started to work on it with some thread sketching but I want to show it since I will be away tomorrow. Here you can see the stitching a little better. I am short of certain colors I need for this. I'm going to try to make do. 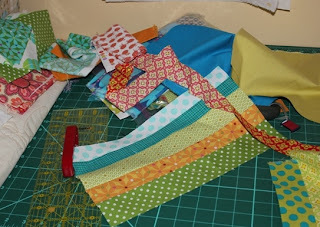 I'll be happy to get to the fabric shop in a few weeks when I go to Fredericton. 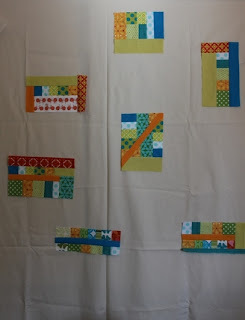 I'm linking to Needle and Thread Network for WIP Wednesday as well. go check it out. There is lots of variety there. My husband painted our kitchen over the weekend. In some ways it's good to have a golf nut for a husband. He had promised to paint last the fall when golfing was over, but we had such a mild fall that he was out until late November. Then it was getting close to Christmas and I didn't want the mess. So, in anticipation of the new season, he was anxious to get it done. It's a nice soft mossy green color which I couldn't seem to get with the camera. It came out best in this spot where I did a mosaic of tiles over my sink and under the window. This morning I had lots of things to put away and a few things to dust off. I've finally put away all of my snowman and made some more spring like arrangements. Those are the roses from my valentine's bouquet. 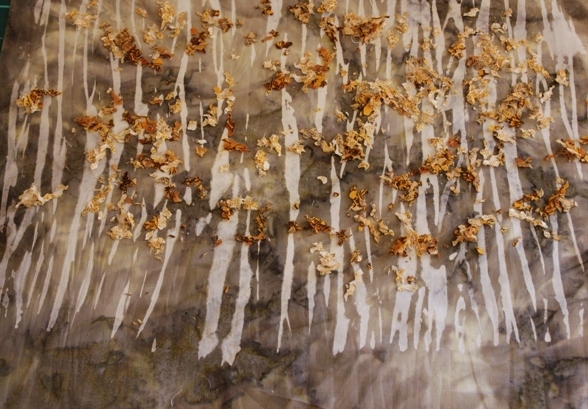 I have an idea in mind of a birch tree forest I would like to do using the shibori method. While looking for the right color fabric, I cleaned out my box of hand dyes. I couldn't find exactly what I wanted --luckily I'll be going out of town in a few weeks where I'll fabric shop--so I tried using a piece of batik. I wrapped it round a tin can, tied it with string, kept winding and pushing the fabric down. 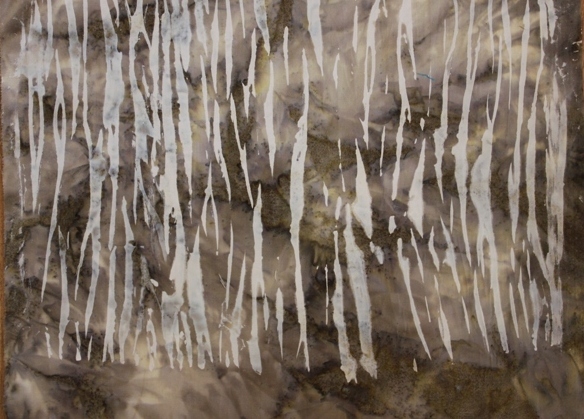 Then I applied a mix of discharge paste and white paint with a sponge brush. I removed it from the can and ironed it being sure to open my window for ventilation. I'm not sure if it suits or not because some of the dots made with the wax did not discharge. 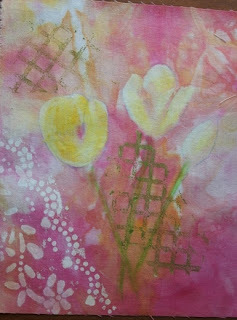 Then I moved on to the larger of my tulip pieces and did a little discharging with a paintbrush and some paint. It looks a little rough in some places; the discharge paste is quite gel like. I think the thread painting should help even it out. Finally, I sat down to my computer desk and quickly sketched a few zinnias. They were on my mind this morning. The glorious unseasonably warm weather is making me think of summer flowers. I haven't grown these in a couple of years. I think I must find a place for them this year; they are so colorful. Yesterday was a guild UFO day. As usual I can't show the quilt I'm working on but I thought you might enjoy this beautiful quilt made all in batiks by Gisele. (She's not in the picture). 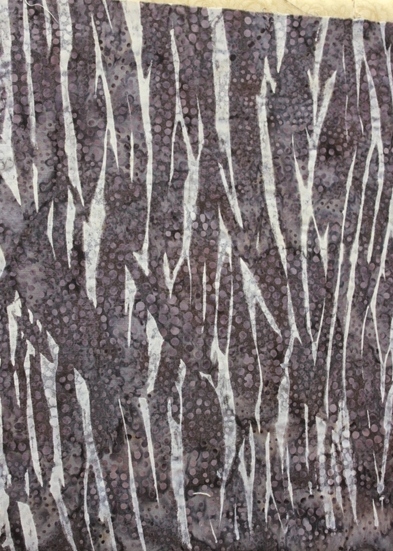 The picture doesn't do the batik's justice either, but I loved the pattern. 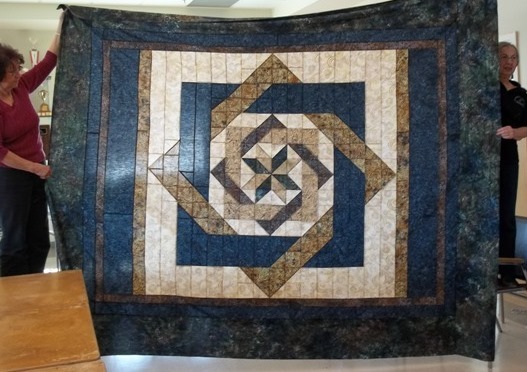 I believe it was called Labyrinth from Keepsake Quilting. 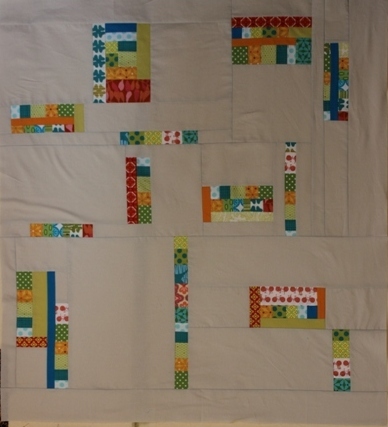 Also, although I know it's a little late I wanted to share the link to a site called The Quilt Show. It is a quilting web site run by Alex Anderson and Ricky Tims with all sorts of resources. 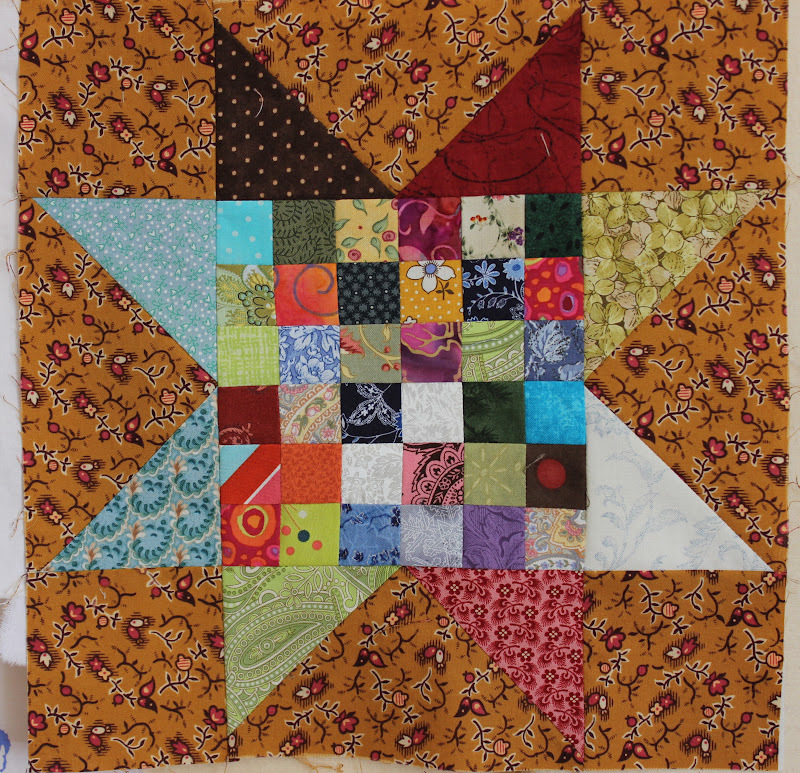 Thee fun thing is this weekend is International Quilting Weekend, and although normally you subscribe to most of the shows, they are open to the public this weekend. I watched an excellent one with Susan Brubaker Knapp last night and I'm about to check out more. I did get the quilting done on my two little tulip pieces yesterday, but I also got groceries and a had a doctor's appointment so I didn't have time to post. This is what my work table looked like in the morning. I added some foil and some Shiva paint stick color for some highlights. You can see where I applied the glue before rubbing on the foil on this one. This morning I went for a walk . Even though it was still cold you really can feel the spring in the air, especially when the sun is shining as it is today. 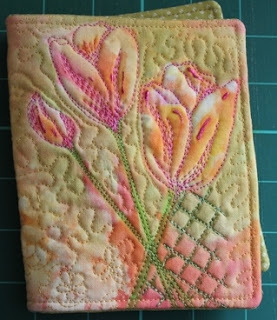 I went for my Friday lunch and when I got home, I put one of the tulips together as another needle case. I used a piece of felted wool from a sweater for the pocket and another piece of wool for the needle catcher. Then I sewed right sides together, turned it and then top stitched. The second piece is a little bigger so I'm not sure if I'll make another case. It could also fit a small notebook I think. While I was at my swim this morning, my mind was preoccupied with how I would proceed with the tulips. I kept losing track of my laps! 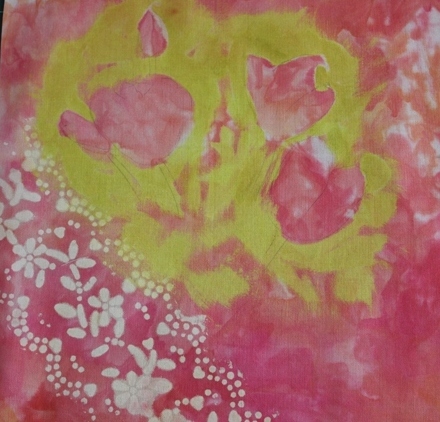 What I did was to take two smaller pieces from the snow dyed fabric to experiment with. I had two ideas; the first was to take discharge paste mixed with a small amount of green fabric paint and applied it around the tulips. I used quite a light hand here as I wanted a little color and I wanted it to fade into the pink. I added a little texture with a stamp(a piece of a plastic berry basket). On the 2nd piece, I mixed the discharge paste with a small amount of bright orange fabric paint and then lightly applied it to the tulip shapes. Again I applied it sparingly because I still wanted to see some of the mottled effect from the dyeing process. Besides stamping again, I also pounced some discharge paint through a piece of paper lace. 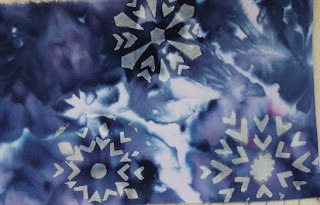 Next, while I had the paste out, I mixed a bit of white paint and dabbed it over the snowflake stencils I had made for another piece a few weeks ago. I know winter is almost done. I just wanted to use the paste while I had it out. Once they were dry I ironed them. This is what activates the discharge paste. Then I rinsed them out, re-ironed and sandwiched them for stitching. I thought it would be fun to make the two pieces into more sewing kits. 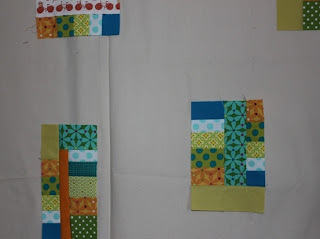 I want to do a little more stitching to add some sparkle and then finish quilting them. I may also add some iridescent paint sticks for shine. Now that I've seen how my two approaches work, I'll decide which one to use on the larger piece. For now though I'll finish these up in the next few days. 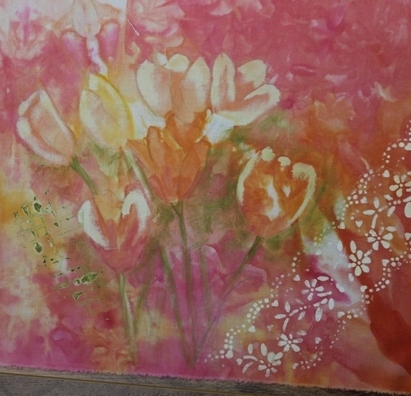 Which one do you like best the first example with the green behind the tulips or the second one? I've been in an uninspired funk for the last several days which is why I pulled out my postage stamp for some mindless work. I took the 6 by 6 square that I put together yesterday and made it into the star block. 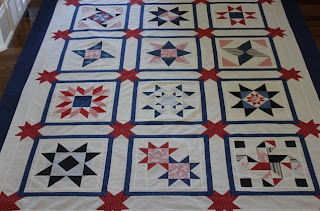 Now I have 8 finished stars and I have 2 more 6 inch blocks done. I did a little diagram of how I'm thinking of putting it together in my little graph paper book. 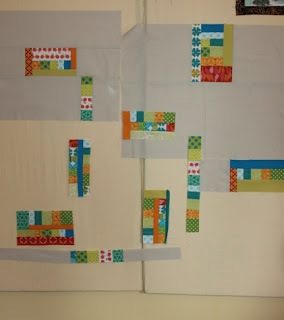 A graph paper book was a recent wonderful discovery for planning out quilts. It would make it about 48' square so I 'll have think of what to do for more borders. I don't think I'll make enough postage stamp blocks to go around again. Then I was calm and satisfied and able to turn back to my creative work. 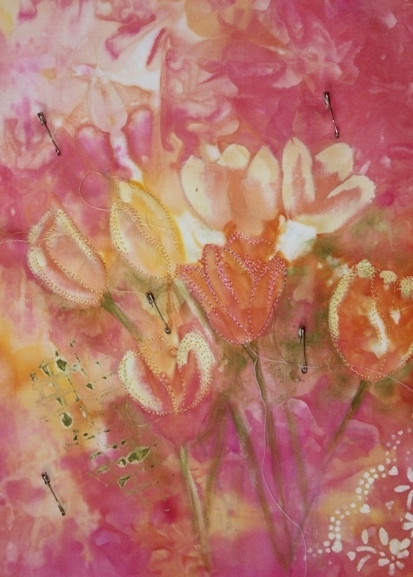 The odd serendipitous thing about my recent snow dyes is that I had pink and orange tulips in mind when I mixed the colors up. I randomly scrunched up the fabric under the snow dye, but lo and behold when I ironed the fabric and scrutinized it more closely, I could see tulips! Next, I went searching through last year's garden photos where I found pictures of my pink and orange tulips and made a quick pencil sketch. Here I have lightly outlined them with quilter's chalk on the snow dyed fabric. I hope you can see them. Now I'll be anxious to get back to it tomorrow. It started out this morning sunny, but cold, around -10C and by this afternoon it was supposed to reach +6C which it sure feels like. Great weather for the maple sap to run! I got my clothes on the line, met friends for coffee and went for a walk before lunch. I had a quick appointment this afternoon, and since then I've been puttering in my studio. I've been pulling different things out and putting them away all weekend, not finding what I wanted to work on. 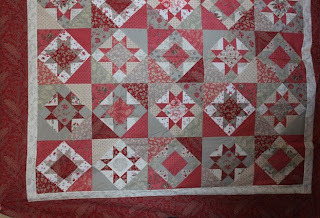 I'm taking a little break from the art work to do a block for a quilt that has been sitting in my closet for a while. Whenever I was cutting fabric for a quilt, I would cut the small scraps into 1 1/2 postage stamp size bits. I've been collecting them for a while, and when I am stuck, I pull out the box and put a 6 by 6 block together. 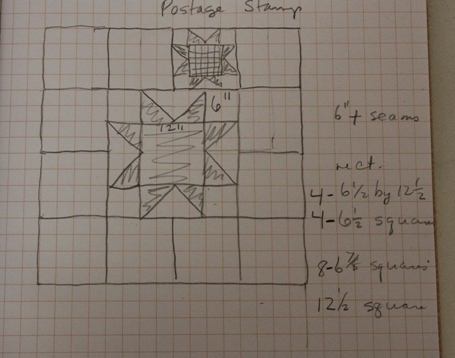 I have made 7 star blocks with the postage stamp centers and I have 4 more postage stamp blocks done. When I have 12 star blocks finished, I will look for an arrangement. 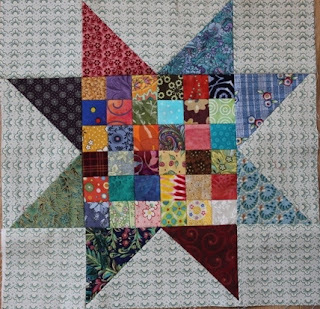 I was thinking I might make a large star for the center and put the other blocks around it. It's a long term project. 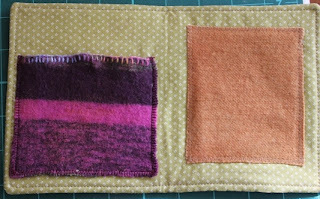 Yesterday, I also got the binding stitched down on my collaborative piece with Margaret Applin at Scrap Wisdom Collage. I have the poplars piece up on my design wall and every time I walked by, something bothered me. I figured out it was the lower tree/bush line. I'm going to move the sky color lower as you can see in the picture on the right hand part of the photo. Once I get that right, I can get back to quilting and embellishing.